Brilliant! Much quicker to do than carve a pumpkin, heehee. Electric tealights only, or you might get 'roasted peppers'! How cute is that? What a great way to get kids to eat healthy veggies. I might just do this for me and Hubby on Halloween! That pepper pumpkin is very cute, Kitty. I love your teacup with the robin and the towel is really pretty for a Fall tea time. Thanks for sharing and have a lovely day. Great job my friend! :) You have another beautiful table setting ~ the towel is perfect and the teacup looks like fall. This is the cutest idea! Your grandkids would love it! And you're right. That teacup and tea towel are perfect together! I didn't see the face on the pepper at first but what a cute idea for serving veggies. 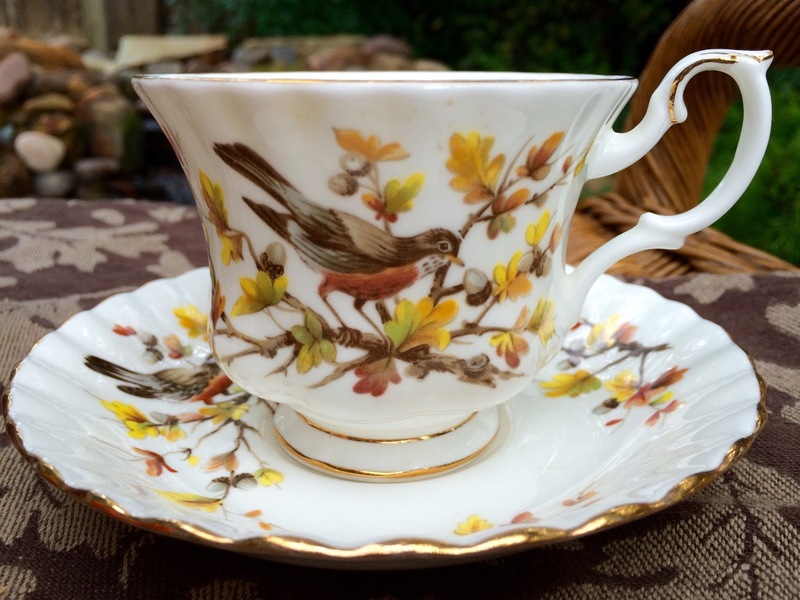 Love the teacup with the bird on, perfect for an autumn tea. This is such a fun idea and so simple! It just makes you smile and makes you want to eat your veggies! That is sooo cute! What a creative idea. I do believe it would entice youngsters to eat their veggies! Thanks for such a wonderful table. Have a great week! Your appetizer is super cute and the alliteration made me smile. The RA teacup is perfect for the season! How adorable is this?! I love it! Gorgeous teacup too. Enjoy your week!! Kitty, that is too cute! I love your tea towel and pretty teacup as well. Thanks for sharing such a cute idea! What I really noticed Kitty is that you figured out a way to print recipes right from your blog. Brilliant! That will come in handy for those of us who want to try your delicious recipes! What a great idea. And oh, that waterfall in the background always looks so soothing. It makes a lovely backdrop for your outdoor teas. Your teacup is new to me -- very nice for fall. What a darling idea! And that towel DOES look perfect with your tea cup...what a kick! Tickled to see your print button too - how handy. So glad you shared this fun idea. That woodland tea cup is perfect for fall. Cute idea you shared here! This is adorable. It would be great for Halloween dinner. Adorable pepper Jack Kitty and I LOVE your Royal Albert Woodland Series teacup...perfect for fall nesting! What a Perfect Precious Peter Pepper Pumpkin!! Sooo creative! That is so cute! And I love your fall teacup and acorn towel. Your mums are such a lovely pop of color! Thanks so much for linking to Tuesday Cuppa Tea! 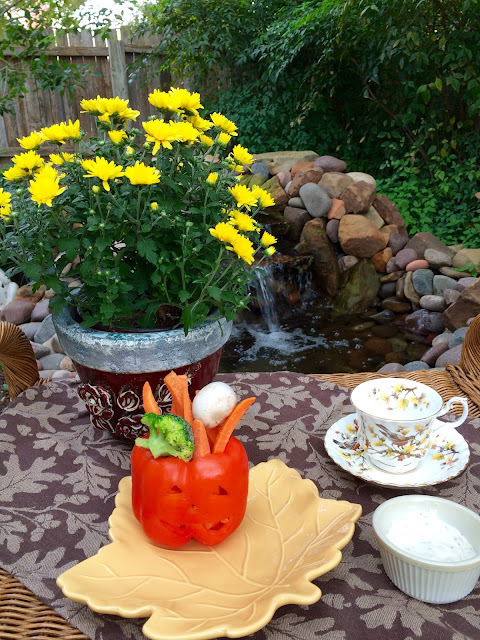 Hi Kitty, what a really cute idea for fall entertaining! Kitty, that pepper idea is too stinkin cute! I left a post yesterday, but I see I must have not published it. Your mums are to pretty too! That's a very cute idea that the grandchildren would love. And what a pretty setting you've photographed - the towel is lovely, as is the teacup. Good evening, my wonderful friend! I just love your pepper :) I had seen them on Pat's blog and thought they were just the cutest. Yours looks adorable. And that tea cup...be still my heart! What a beauty, my friend. So cute and clever (healthy too)! Your teacup is a wonderful fall pattern. I wonder if Royal Albert produced dishes in that same pattern. Wouldn't it make a nice set for Thanksgiving? Love the teacup. Your pepper pumpkin is a good idea,so cute! This is so cute Kitty! Love your ideas and the teacup too! I tried this with my pumpkin patch salad, the peppers are harder to cut than I thought, my pumpkin turned out with kind of a sick smile! Your cup is adorable Kitty, how many tea cups do you have? Kitty, what a perfect autumn teacup! I love the shape of the handle. I need to start adding a few autumn touches to my home. So cute Kitty and nutritious too. Lovely teacup! Oh, I love your little picked pepper pumpkin Kitty. So cute and a great appetizer! The towel and teacup are just darling as well. Thanks for sharing with SYC. Very cute little pepper pumpkin and a good, healthy idea! Wow - what a wonderful healthy treat! So cute. Your whole vignette is so sweet. Thanks for sharing and linking this cuteness! I just love this idea. It's so nutritious too. I am sure your grand children will also love it if they come over this Hallowe'en. Your birdie teacup looks so pretty with the towel. What wonderful friends you have and they know your taste. Your fall colours are so perfect for the season. Blessings Sweet Friend, Karen. I just love your special teacup and it so perfect for fall. Your Appetizer is the cutest thing ever and what a clever idea! Hope you are enjoying this amazing weather we are having. Thanks so much for sharing with us at Full Plate Thursday. Have a great weekend and come back soon! 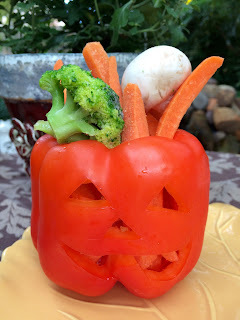 What a fun way to eat healthy at Halloween! Your cup and saucer are precious, too. Thank you for joining Monday Social. What a cute idea! I love festive ideas like this....would be cute for school party.... For a 3Rd grade party (many years ago...), I carved 30 oranges to look like pumpkins and we filled them with ice cream! Lol! Your peppers ate a healthier alternative! Live that sweet little teacup too! So pretty!! The pepper pumpkin is just too cute! Fun! But have to say, I fell in love with the RA teacup. It really does look like the woodlands with a pretty bird visitor. Perfect for fall! The pumpkin pepper is a cute idea for this time of year, and I appreciate you, and Pat, sharing with us! I am always pleasantly surprised to find creative ways to celebrate different holidays with ordinary materials and food. Just a little creativity adds so much to table settings and make getting together FUN. Thank you for sharing this at Monday Social.